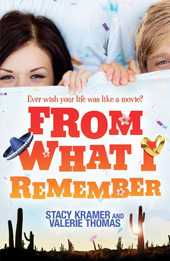 I really enjoyed from what I remember and thought it was a really cute story. The story starts in the middle of the action. Kylie wakes up hungover next to the best looking boy in school called Max in Mexico and wearing what appears to be a wedding ring. If it couldn't get any worse standing over her is Max's girlfriend Lily. All this on the morning of her graduation ceremony she she is supposed to giving the valedictorian speech! The thing that really dragged me in and made me really enjoy this book was the characterisation. I normally struggle with books told from a variety of points of views but in this case it really worked. I really felt like I got to know each of the characters and loved them all individually. For me this story was about relationships and seeing people for who they really are. I loved the relationship between Max and Kylie. Up until the events of the book they've barely talked despite being in the same school for years Kylie is the brightest girl in school and Max is the coolest boy in school. Despite appearing to be worlds apart once they are forced to talk they actually find they have more in common than they both realised. The other relationship I loved in this book was the one between Kylie and her best friend Will. I loved the way they looked out for each other and how they just took each other for the people they are. Quite honestly the of is the best friend I wanted in high school and never had. The story unfolds brilliantly and had a feel of watching a movie whilst reading it. It's funny, heart warming and pacey throughout and keeps you wanting to read more. A real page turner which I will be recommending to other regularly. I loved this one too! Definitely like a movie unfolding. I think it might be my favourite read of the month. I liked the friendship between Kylie and Will a lot too-they were such good friends and could trust each other with anything.